The St. Joseph Professional Building has been purchased by Boxer Property. HOUSTON – (Realty News Report) – Boxer Property CEO Andrew Segal, a bellwether in Houston real estate investment, has made a play on the Pierce Elevated, a downtown freeway destined to be torn down. Boxer just purchased the 136,000-square-foot St. Joseph Professional building, which about 100 feet from the elevated freeway. TxDOT is planning to re-route the Pierce Elevated, which is Interstate 45, and move it to the east side of downtown near the George R. Brown Convention Center. The removal of the Pierce Elevated will be transformative because it has served as a grotesque barrier between downtown and midtown Houston for decades. The fact that Segal has noticed the Pierce Elevated potential is noteworthy. As a recent college graduate, Segal launched his investment program here in the early 1990s while Houston was still recovering from a massive economic crash with $10 a barrel oil and catastrophic jobs losses. Foreclosures were everywhere. Picking among the carnage, Segal began buying Class C office properties. Boxer offered low rental rates, attracting small businesses and entrepreneurs who were starting over after the economic crash. On the buildings’ exteriors, Boxer plastered garish yellow signs inviting tenants to call “777-RENT” to lease cheap space. Simply put, Segal made a fortune with Boxer. He took the company national. With an uncanny sense of timing, Segal moved in and out of various cities – buying office buildings when prices were low and selling when they were high. Houston-based Boxer now controls a 17 million square-foot portfolio with over 100 properties across the nation. Freeways create almost impenetrable barriers for development. They can serve as border walls between neighborhoods of mansions and blighted slums. Removing the Pierce Elevated removes the border between Downtown and Midtown. Without the Pierce Elevated Wall, the two districts blend together. Property in the northeastern part of Midtown gradually becomes a desirable place for new high-rise office or residential development. Land prices – and tax revenue for governmental entities go up. Just theory? No. There’s proof. In Dallas, land values next to Klyde Warren Park (a former urban freeway covered by green space) went up at least 60 percent in a two-year period, according to Phil Puckett of CBRE in Dallas. Prices for surface parking lots near the Dallas park soared to $400 per square foot. Then, there is the land that’s now underneath the Pierce Elevated – a mile long strip of trashed-out filthiness covered with concrete dust and the constant noise of overhead traffic. For decades, the space under the freeways has been known as an unofficial campground – and toilet – for the homeless. What if the under-the-freeway space was sold for residential development? Or transformed into pocket parks with green grass? This strip of loud and dirty freeway blight is transformed. Instead of being a place to be avoided, it becomes a valuable magnet for new development. So this is where Andrew Segal is taking a position. Boxer’s new acquisition, the 18-story St. Joseph Professional building, 2000 Crawford St. is located on a block bounded by La Branch, Gray, Crawford and Pierce streets. It is 55 percent occupied. 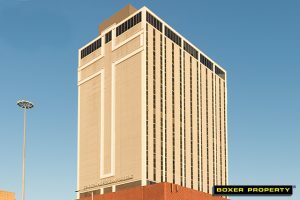 Boxer will rename the St. Joseph building. The elevated freeway next to it will go away within the next decade. If it’s done right, this southern part of downtown Houston could become highly desirable place. Midtown to the south and EaDo to the east of downtown could take off. If it’s done right, Boxer Property won’t be the last investor to buy property next to the Pierce Elevated. 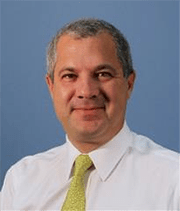 Andre Pereira, Director of Acquisitions, represented Boxer Property during negotiations. Rudy Hubbard, Kevin McConn and Rick Goings of JLL represented the seller, Mission Cos.